Special pyrotechnic shows planned for Fourth of July weekend. 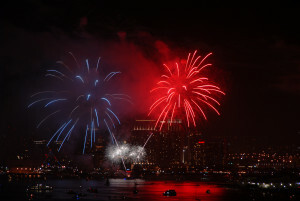 There is no better way to help celebrate America’s birthday than with fireworks at one of the many Fourth of July shows scheduled throughout Southern California cities and harbors. To help you with your holiday plans, here is The Log newspaper’s annual list of Independence Day fireworks shows and related activities that the whole family can enjoy. Red, white and blue colored fireworks will light up San Diego Bay during the show that can be seen from a boat or on land. Best Views: Shelter Island, Harbor Island, North Embarcadero, Seaport Village, South Embarcadero, and Coronado Ferry Landing. Boating Info: Boaters are instructed to stay outside of the 300-yard safety zones around the fireworks barges off Shelter Island (32 degrees, 42.78 minutes north latitude; 117 degrees, 13.28 minutes west longitude), use proper signals and navigation lights, arrive before dark and keep a lookout for other boats; Harbor Island (32 degrees, 43.33 minutes north latitude; 117 degrees, 12.00 minutes west longitude); the Embarcadero (32 degrees, 43.04 minutes north latitude; 117 degrees, 10.82 minutes west longitude); and Seaport Village/Coronado Landing (32 degrees, 42.20 minutes north latitude; 117 degrees, 10.04 minutes west longitude). Fun Events: The annual firework show will light up San Diego. Fox5 (San Diego) and KTLA (Los Angeles) will start their live programming at 8:30 p.m. and run through 9:30 p.m. The show will also have a musical simulcast on The Mighty 1090 AM and Max FM 105.7. Best Views: Aboard the 1898 steam ferry Berkeley or from the museum venue. Fun Events: An Independence Day picnic dinner aboard the steam ferry Berkeley — $35 for adults, $18 for children — will feature barbecue chicken, burgers, coleslaw and more; first seating 5-6:30 p.m., second seating 7-8:30 p.m.); spectacular views of the Big Bay Boom fireworks display. Fireworks viewing admission: 8:30 p.m., $10 for adults and $8 for children 12-3 years of age. Best Views: U.S. Olympic Training Center, Mountain Hawk park and New Hope Community Church. Info: After an eight-year absence, July Fourth fireworks are back in Chula Vista. Fireworks will be set to a custom soundtrack heard on 91X. Fun Events: A day packed with festivities starts with the Crown City Classic 12K, 5K and kids half-mile fun run/walk at Tidelands Park at 7 a.m. Other events include a rough-water swim at Central Beach (check-in at 7:30 a.m.), Art in the Park (8 a.m.-4 p.m.), the annual Independence Day Parade along Orange Avenue (10 a.m.), a Coronado Community Concert Band performance at Spreckels Park (4 p.m.) and fireworks viewing over Glorietta Bay at 9 p.m. Music by KYXY 96.5 FM. 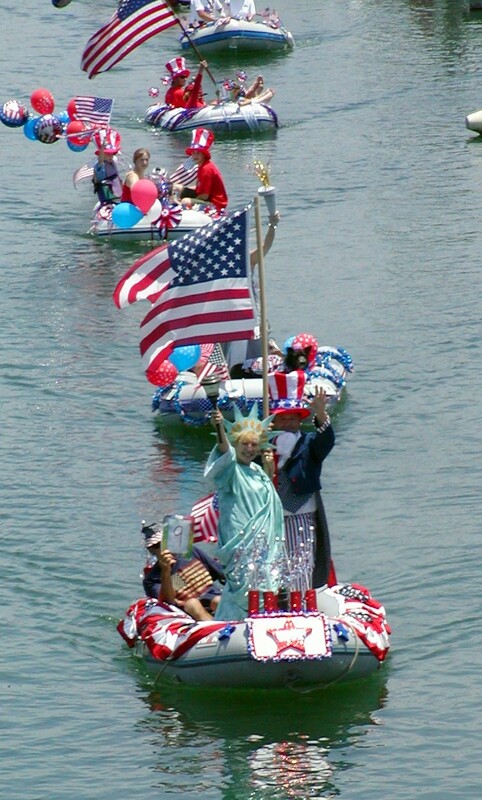 Info: Boaters can enter the 15th annual contest and decorate their dinghies (12 feet and smaller) in the most patriotic way possible. Trophies are handed out to the top four entries. Skipper’s meeting starts at 10 a.m. The parade can be seen from the municipal fishing pier, the Jolly Roger docks, the grass lawns along the harbor and from Dolphin Dock. Info: The public is invited to the city of Oceanside Fireworks Show. There will be music and food trucks. Bring a beach chair, and walk to the viewing area on Rancho Del Oro Road. This event is free and open to the public. Info: The fireworks display can be seen from many beaches and hilltop areas in and around San Clemente. Best Views: Fireworks are shot from a barge outside the harbor, so boaters in Dana Point Harbor have some of the best views. Heritage Park and Lantern Bay Park are also good viewing points. The fireworks are synchronized to music on 88.5 FM KSBR. 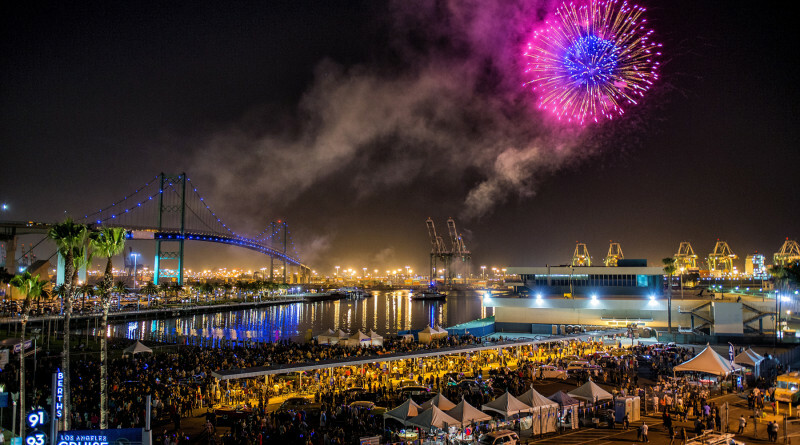 Fun Events: Dana Wharf Sportfishing is offering a fireworks display cruise at 8 a.m. ($45, adults; $29, children ages 3-12, free for children 2 and younger). Contact: dohenystatebeach.org; Dana Wharf Sportfishing: 949-496-5794 ext. 7. When: Activities from 3-9 p.m., fireworks start at 9 p.m.
Fun Events: This all-day event will include live music performances, food trucks activities in and around the water and a spectacular pyrotechnic display. 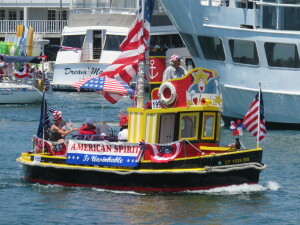 Boating Info: All boaters are invited to decorate their vessels and participate in American Legion Yacht Club’s yacht parade. Participants will compete for class awards such as “Best Decorated,” “Outstanding Music,” “Finest Costumes,” “Most Creative,” and the “Commodore’s Award.” Registration is free and online at the American Legion Yacht Club’s website. Fun Events: The annual golf cart parade down Crescent Avenue will be lead by the University of Southern California Matching Band this year. Guests can enjoy a barbecue and buffet dinner, along with music, inside the Casino Ballroom’s balcony and overlooking the fireworks display. Avalon Bay Dinghy Parade at 4 p.m. Fireworks will begin at 9 p.m. over Avalon Harbor. 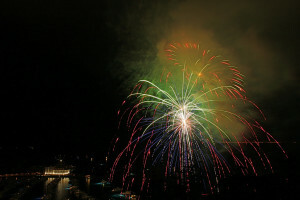 Fun Events: A fireworks spectacular is set to blast off over Isthmus Harbor, beginning at dark July 3. 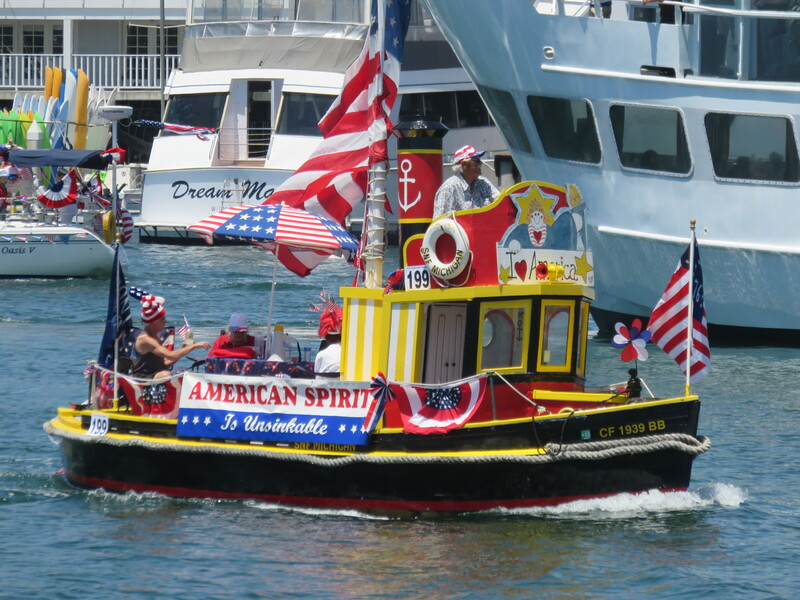 On July 2, boaters are invited to decorate their dinghies in the most patriotic way possible, and participate in a parade through Catalina’s West End coves. Prizes will be awarded to the most creatively decorated dinghies. The Children’s Festival will feature crafts and activities from 10 a.m.-noon. Fun Events: The three-day event will feature food vendors, live entertainment and family activities every day from 10 a.m.-9 p.m. The Fourth of July events include the Surf City 5K Run and Fitness Expo (7 a.m.-noon), the 112th annual Fourth of July Parade (10 a.m.-noon) and the grand finale fireworks display shot off the end of the pier, beginning at 9 p.m.
Fun Events Live entertainment and DJs. A fireworks show can be enjoyed at the Belmont Veterans Memorial Party on the Pier event ($10 for adults, kids free with paying adult). When: From 2-11 p.m., July 4, fireworks begin at 9 p.m.
Fun events: Travel through the heartland of America during this All-American event that includes a Coney Island style carnival and circus, carnival games, a Nashville Tailgate with a live country band and line dancing and a Texas Hold’em game. Next it’s down to the Deep South as guests take a tour of Louisiana showcasing dueling pianos and a New Orleans marching band. Complete the tour with a head out west for a little glitz and glamour at the Hollywood party and a stop at the Hawaii party where Hula dancers will provide dance lessons. Fireworks begin at 9 p.m. General admission tickets are $44 online/$49 walk up for adults, $24 online/ $29 walk up for children ages 11 and younger. Adult VIP admission, $99. 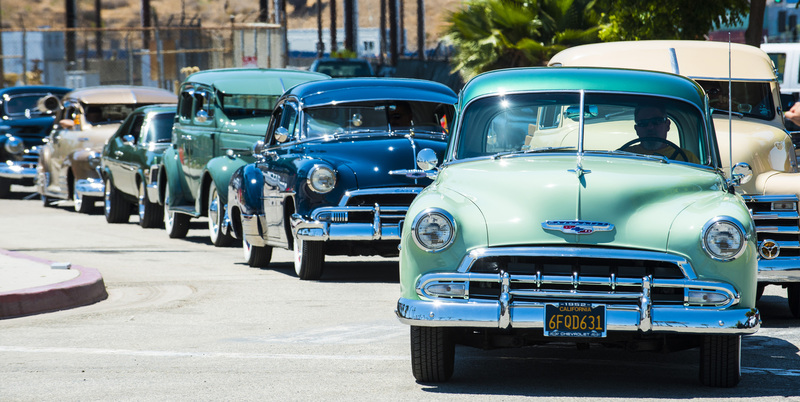 Classic cars will be on display at the Los Angeles waterfront during Cars and Stripes Forever.Photo courtesy of the Port of L.A. When: 5-10 p.m., July 1; fireworks at 9:20 p.m. Parking: There will be parking at Harbor Boulevard and First Street. A free shuttle to downtown San Pedro will be provided. Fun Events: Enjoy live music, family activities and fireworks. Best Views: Fisherman’s Village, Burton Chace Park and Marina Beach are popular spots to watch the 20-minute fireworks show. When: Gates open at 2 p.m., July 4; fireworks at 9 p.m. When: 7 a.m.-9 p.m., fireworks at 9 p.m., July 4. Fun Events: The all-day event includes a 10K race and 5K fun run/walk (7 a.m. registration, race at 8 a.m.), a Children’s Parade at 10:30 a.m., an Electric Boat Parade at 4 p.m. and a fireworks display. Marine Emporium Landing will have activities between 11 a.m.-9 p.m., including a crafters’ market, inflatable fun zone, a rock climbing wall and food booth. 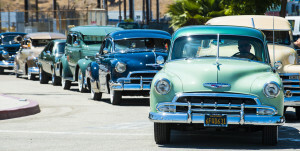 Fun Events: Festivities at the Santa Barbara waterfront include food vendors, a music variety show and a fireworks display. Music for the celebration will be simulcast on 92.9 KJEE. A variety of other Independence Day celebrations are planned citywide.